The Google Chrome web browser is quite powerful with many interesting under-the-hood options that are hidden from the average user, but with a little digging around you can uncover a variety of power features that allow users to perform helpful tasks. 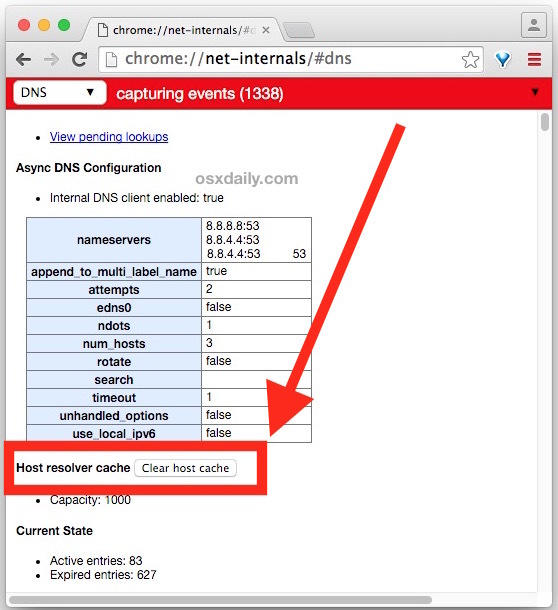 One such hidden feature is the ability to manually clear out Chrome DNS host cache from just the browser itself, this can be invaluable for situations where a user has changed DNS settings or where flushing system DNS in OS X is either insufficient, ineffective, or impossible. While this could be valuable for any user who is working with DNS, web workers and developers should find this Chrome specific DNS clearing trick to be particularly useful. Note this has nothing to do with clearing general web cache and history from Chrome or removing cookies from Chrome, this is specifically focused on DNS caches. This browser limited DNS cache flushing trick is the same in all versions of Chrome whether for Mac OS X, Windows, or Linux. Once the Chrome DNS cache has been cleared out your active and expired entry count will reset to zero and the browser will have dumped all DNS caches. You do not need to relaunch the Chrome browser for changes to take effect to DNS cache, which makes this a little less intrusive (and browser specific) compared to flushing system DNS. If you’re doing this to help resolve a particular server or URL, try visiting the URL again and with the DNS caches flushed it should work fine. Again, this will not impact the general browser data in Chrome, it is limited to DNS caches contained within the Chrome app. You must clear web caches and history in Chrome separately if you’re looking to simply remove stale versions of a page or some other web data stored locally. Chrome has many features beyond what is obvious to the average user, making it one of the most powerful web browsers out there and a favorite for web developers and designers. If you’re interested in learning more about some of the fancier hidden tricks available in the Chrome browser, you can monitor web bandwidth within Chrome, discard memory from unused tabs, change the user agents within the browser, and much more. Works in Chromebooks too, thanks!